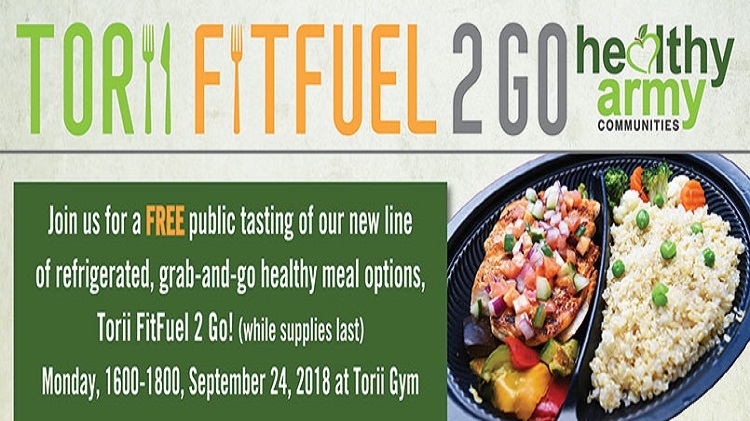 Date: Sep 24 2018, 4 p.m. - 6 p.m.
As part of the Healthy Army Communities initiative, Torii MWR will be launching a new line of refrigerated, grab-and-go healthy meal options, Torii FitFuel 2 Go on October 1st! Join us as we have a free public tasting event (while supplies last) on Monday, September 24, 2018 from 4 to 6pm. All Torii FitFuel 2 Go meals are made using fresh ingredients and provide a well-balanced meal and will be sold 7 days a week at Torii Gym. Be sure to check out our refrigerated case at Torii Gym starting October 1st or call 644-4334 for more information.